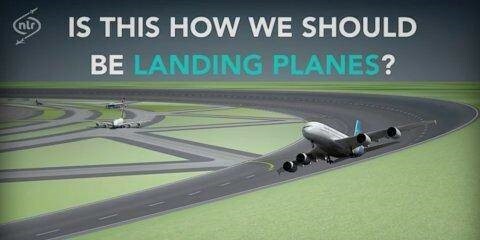 Precocious Thinker: Circular Runway concept doesn't seems to be all good! It is worth noting, however, that circular runways are not a new concept. Today, any airport can be referred to as the technical term of “aerodrome,” but in the early days of aviation, it specifically referenced airports that had large round runways. Netherlands aerospace centre has been researching a circular runway for years with government funding, I must concede that they may have answers and solutions to below issues that were not provided in the short BBC report. This designer says the aircraft can land at a slower speed, which I don’t see as necessarily safe. Wings will generate the most efficient lift when levelling to the ground, perpendicular to the demands of gravity. Any rolling or banking affects that, increasing the stall speed of the aircraft, making it more dangerous to fly slower. This is not to mention that you may have other aircraft on other sections of this perpetual runway that this aircraft would now be encroaching on. That means that what would otherwise be a well-practised and non-issue engine loss instead receives more possible contributing factors to an accident. Another big concern is traction. On a curved runway, while the pilot is trying to comfortably plant the wheels down (while in a bank above the slanted runway, mind you), the centerline of the curved runway will be drifting off-centre to its side, now adding the need to also turn the aircraft to the pilot’s workload. First, if the wind is anything less than calm or very light, there is no way that 3 aircraft can land simultaneously in different areas of the circular runway if you are trying to avoid crosswind. So, we will have to still wait until the researchers finally conclude the result.